The latest Notts SOS newsletter for Mayday and beyond (no.5) covers the recent ‘Save our NHS: Kill the Bill’ meeting, a new campaign to stop closure of Hayward House Daycare on the City Hospital site, and a report from the 26th March TUC demo, looking ahead to what will hopefully be coordinated strike action on June 30th. Download Word version of Newsletter #5 or Download PDF version of newsletter #5. Forthcoming events mentioned in the newsletter include Mayday on 30th April and the Green Festival coming up later in May. Also don’t forget the Mayday social next week: Thursday 28th April MayDay Social, Polish Eagle Club, 2 Sherwood Rise, Nottingham NG7 6JN, 7.30 pm to late. 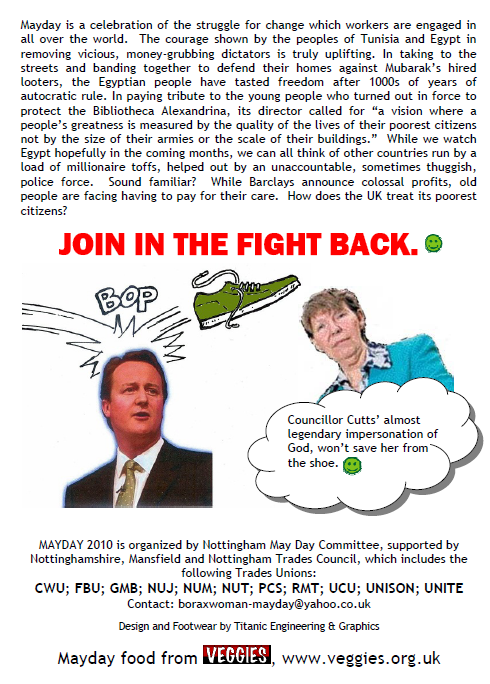 Also : Download Nottingham Mayday 2011 flyer. Recent weeks have seen a surge of local activity in defence of the NHS. Cutbacks will hit the health service and the proposed “reforms” of the NHS will lead to widespread privatisation. Speakers have been invited to explain the issues and why the Bill must be opposed. Do come along. Hayward House ‘hospice within the hospital’ at City Hospital, Nottingham cares for terminally ill patients. Its methods encompass compassion, dignity, and clinical expertise in palliative medicine. Its approach integrates medical, social, personal, emotional and community care in a way unique in Nottinghamshire. This has brought quality of life back to the last months and days of many patients. 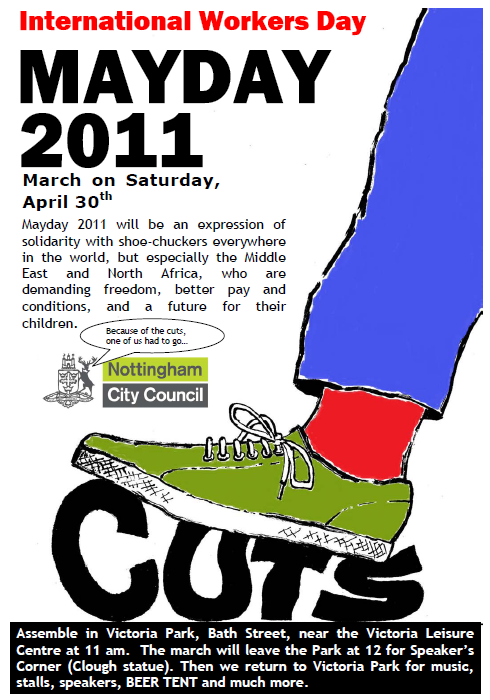 Nottingham PCT are closing daycare from September 1st 2011 – we cannot let them. Visit the website: http://www.savehaywarddaycare.org.uk for more information and how to get involved. On Wednesday, April 20th, 8.00am News on BBC Radio Nottingham plus news bulletins throughout the day will feature the proposed closure of HH daycare. Also watch BBC East Midlands News at breakfast, lunchtime and early evening. Also, look at the Evening Post on (we think) Thursday, 21st April. On Saturday April 30th, Save Hayward House Daycare Campaign will be having a stall at the Mayday celebrations. Assemble in Victoria Park, Bath Street, near the Victoria Leisure Centre at 11 am. The march will leave the Park at 12 noon; why not join us? Bring your Save Hayward House Daycare placard! There will be speakers at Speakers’ Corner near the statue of Brian, then back to the park for music, food, more speakers, more food etc, etc.